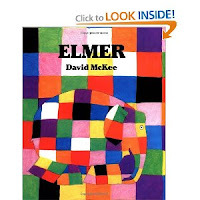 Friday's story was "Elmer," by David McKee. This book celebrates the joy of being different. It is a wonderful story of a unique elephant that wants to be like everyone one else. When he does finally become like the other elephants he isn't as happy as he thought he would be. He finds it is great to be who you are! After reading the story the children watercolored a picture of Elmer. I found a great Elmer at The Virtual Vine. This site actually has a whole lesson plan around Elmer. I have to tell you I was a bit unsure how the Pre-K would do with watercoloring all the little squares that make up Elmer. But, of course, they surprised me. Most of them did a super, super job. After the elephants were dry, we cut them out and displayed them on the wall. They look so great.